The flight to Palau took about two and a half hours, fast and uneventful. We landed at a relatively small airport (not too high-tech, I noticed; the boarding stairs were pushed rather than driven), where the facilities are simple and the customs officers are strict. There was one line at the customs check for US citizens, one for non-US, and two lines just for Filipinos. Was it because there were more Filipinos arriving? Or because Filipinos always bring in food, even if it’s not allowed? We boarded the shuttle bus to the live-aboard and watched the scenery roll by. The capital town of Koror is very small and rural, consisting of numerous small buildings, none higher than a few stories, scattered along narrow roads which crisscross the hilly island. A distinctly American island atmosphere is evident, but it sits alongside a very strong Japanese influence. When we arrived at the dock, the Big Blue Explorer sat before us. It’s an excellent live-aboard: very large, about 50 meters long, with five decks and many cabins (I haven’t counted them yet). Our rooms each have toilets and showers, bunk beds, airconditioning, and a nice little porthole looking out to sea. There’s an airconditioned saloon downstairs, with a complete entertainment system; and an open dining deck upstairs, as well as a forward sun deck with jacuzzi. Aahhh, now this is a vacation. The crew is accomodating and wonderfully hospitable. The dive instructors are an especially intriguing bunch, richly varied, coming from places like England, Scotland, Australia, Switzerland, and Guatemala, each of them warm and friendly. My first dive here. The first thing you notice when you jump in is that the water is much warmer, very cozy, almost embracing you, and wonderfully clear, as compared to the cooler, cloudier waters of Anilao. The coral itself is not too colorful, but the sea life is fabulous: lots of fish in any given place, and always a large school of something or other swimming by. 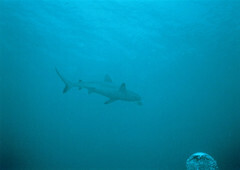 We dove along a steep slope, watching fish go by, and at one point, a small grey reef shark passed below us. A sea turtle also made an appearance, swimming overhead and soaring placidly into a school of fish. Floating by the wall was a giant puffer fish with funny buck teeth, hardly caring that we hovered right beside it, bubbling away and taking pictures. I had buoyancy problems; my usual 6 lb. weight belt seemed too little, and I found myself floating up at unwanted times — dangerous if unchecked. But the instructor told me it could just be excitement making me bouncy, so that I’m full of air. One nice thing about diving here is that the chase boats follow you around, so that there’s no need to swim back to your starting point. When you surface, the chase boat’s right there to pick you up. But you have to swim away from the reef and surface in the blue after a safety deco stop, because the boats could have trouble in the shallow water above the coral. Turtle Cove starts with a small hole in the coral in shallow water, no more than 6 feet deep. The tunnel descends down, down, diagonally, and opens into a large hole in the shelf wall, 40 feet down. From there, it’s a beautiful wall dive, bristling with life — and yes, there are indeed turtles. All in all, I must have seen three or four of them, flying by with their front fins flapping like wings. Turtles are shy things, though, so you can’t get too close. Don’t believe what you see in the movies, by the way. Not all sharks are man-eating great whites; these sharks are three to six feet long, feeding lightly on fish, and not bothering human divers as long as they’re discreetly left alone. Yay! I rented a simple Sea-and-Sea diving camera, and I took it along on this dive to take pictures of the life. Anticipating a strong current, the instructor also gave us reef hooks, which you can hook onto rocks or old coral (not live coral!) so you can hang onto the reef while the sea life sweeps by. A giant green-and-blue-spotted Napoleon wrasse met us at the start of the dive, and he was remarkably friendly — so much so, in fact that he joined the group and followed us around as we dove the wall! Reef sharks passed by as well, one very close to me, so I snapped what I hope to be an excellent shark photo. After the wall dive (where I maintained rather unruly depths in my zest to take pictures), we ascended to 30 feet to explore the plateau above the wall. The Napoleon wrasse followed right behind, but disappeared when the chase boat came along. I skipped the night dive. Early in the morning, the ship headed for Peleliu Island. 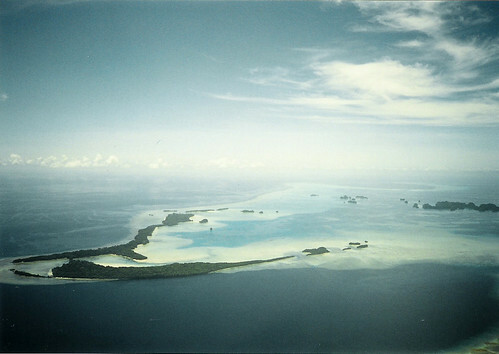 Peleliu Island, according to the ship captain, is notoriously dangerous, with strong, varied currents because of its proximity to the open ocean. Our first two dives there, however, were calm and uneventful, almost disappointing. 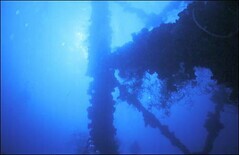 Peleliu Express, so named because it is a current drift dive, started out with no more than the usual coral wall. Little sea life appeared beyond small to medium-size fishes in the coral. Things began to spice up after the halfway point, however. Far below us, resting in a sandy clearing, a grey reef shark was sleeping. As we came closer, it seemed to notice, and sullenly swam away into the blue. Two turtles also made an appearance, and a family of five bumpheaded parrotfish swam by. Currents, while not as strong as I had feared, were unpredictable, sometimes even pulling up and down. There was also a forceful surface swell, reaching down to as deep as 30-40 feet. That took some getting used to. I’m sure Peleliu Wall is normally a great and challenging dive, but we must have caught it at slack tide, because when we dove in, the water was brown and silty, the current dead, and the sea life mediocre. The only real highlight to this dive was a small snake eel slithering through the coral. That was it. I count myself fortunate I had opted not to bring the camera on the first two dives. Even more fortunate, however, that I decided to bring the camera for this one. Orange Beach was a great dive, with tuna and turtles. Two large tuna swam by shortly after we entered the water. I wasn’t able to get a photo, but it was enough to see them bolt past. A bit later, our dive instructor Matt was startled to find, literally under his fins, a large hawksbill turtle intently feeding on something under a large piece of coral. So involved was he in his meal that he didn’t even notice us sidling up to him. And when he did peek out from where his head was buried in the coral, he calmly looked at us, then ducked back and continued chewing. He panicked, though, when my brother and I started snapping away with our cameras, and swam off, but not before we got some pretty good shots. We stopped diving for the rest of the afternoon while the ship headed back for the German Channel. I watched the sunset from the jacuzzi deck, and it was simply classic; cool breeze blowing, seagulls flying by, while the setting sun turned the clouds orange. It was a wonderfully peaceful setting for a lazy Pacific afternoon. Back at German Channel, I opted to join the 8pm night dive back at Turtle Cove. My first night dive promised to be a good one. Even as we were suiting up in the cold night air, we spotted a huge sea turtle swimming at the surface by the boat. Dive lights in hand, we descended once more from the shallow reef into the hole, which, were it not for our torches, would have been pitch black. Diving at night is a whole new experience; your field of view is limited to what your torch illuminates, and in the blackness, sea life which normally lies dormant in the daytime comes out in full bloom. Hard corals had grown small hairlike structures from their surfaces to filter food from the water, while small clear shrimp and little fish darted about, attracted to our torches. Other fish rested in small holes, sleeping. A few big sea turtles came around, too, one of them sleeping with his head tucked into the coral wall. He was awakened by our lights, though, and swam off to find another place further down the wall. One of the most amazing experiences I’ve ever had came when Rico, the instructor told us to swim away from the wall a bit and turn off our lights. We did so, and found ourselves floating in a glowing wonderland of sparkles: the plankton which surrounded us was phosphorescent, and it would light up as we swam through it, glinting with a soft, green glow around our bodies, limbs, and even our exhaled bubbles. I could see the other divers simply by watching the glow of light around them. I was almost reluctant to have to turn on my light again and continue the dive. We spent a little more time on top of the shelf, then swam away from the reef to surface under the stars and get picked up by the chase boat. This was the most dives I had ever done in a single day: four. That night, the boat headed back to Malakal Harbor, where more divers from abroad would arrive the next day. Even with the ship docked in the harbor, there are dozens of dive sites just a few minutes away by chase boat. We started early in the morning with the wreck of the Iro Maru, a 470-foot Japanese tanker, which sank upright after being torpedoed and bombed in World War II. The wreck is huge, in slightly deep water. We did not penetrate the ship; the insides are too deep; but the deck of the ship was still a great dive. The massive guns were still there, on circular platforms at the fore and at the stern, encrusted with coral. While the ship’s funnel had collapsed, massive towers remained standing, extending halfway to the surface and swarming with coral and fish. The water, not too clear, was not too cloudy either, and the wreck made for some great photos. I loved the panorama when looking up from the salvaged wreck; the ship’s towers reaching up from deck, silhouetted by the morning sun shining through the water. It was worth a few wide angle shots. At the fore of the ship, Bond, our dive instructor, hovered away from the wreck and pointed out to us the hole in the starboard side, where the ship had been struck by a US torpedo, a few days before the air strike which sank it. Swimming a short distance away from the bow, I was awed by the size of the wreck, almost fearful of how huge and imposing it was before me. It was a relief to swim back and stand on deck before surfacing. Before lunch, we dove the famed “Helmet” Wreck, so named for the collection of fused helmets lying in the cargo hold. The wreck lies upright on a smooth, sandy incline, beside a shallow reef, lush with coral. Unlike Iro Maru, the Helmet Wreck has not been salvaged, and is still strewn with debris from its sinking over half a century ago. Nippon beer bottles, depth charges and detonator caps, plane engines, and other odds and ends litter its deck and open cargo holds. Upon descending from the mooring buoy, the first thing that greets you is a pair of boxes resting on the bow gun platform, full of gas masks, bottles, and even a small artillery shell. The bow of the ship, deeper than the rear, has two large cargo holds connected by a passage, big enough for a diver to swim through. That was unforgettable; I descended into the first hold, and as I made my way through the doors, I could see the second cargo hold ahead, dimly lit through the silt. Unassembled plane engines and unused depth charges lay there, encrusted with deposits. I couldn’t stay long, though; this was almost a hundred feet deep, and I had to ascend back to deck if I wanted to avoid decompression. After Mom had a “Titanic” photo shoot at the bow of the sunken ship, we made our way back to the stern. On the way, one of the instructors invited me to squeeze into a small door, dive down a silty corridor, and enter the ship’s engine room. Inside rested the huge turbine, lit from above through small portholes. It was another squeeze through a narrow passage and an open door to get out to deck. On ascent, I tarried at 10 feet for a few minutes for a safety decompression stop. As I waited, a new group of American divers came down the mooring line, off to explore the same wreck. Then, I surfaced, off to enjoy a hearty lunch before the next dive. My first cave dive, and what an amazing dive it was! A few minutes’ boat ride from the harbor, nestled in a small lagoon, the cave seems promising from the outside; a large hole in the rock, fifteen feet deep. From the rock face, the cave extends deep into the island, coated at the bottom with white sand, and opening into three successive chambers, each big enough for several divers, with huge pockets of fresh air, so that we could surface in each chamber and breathe normally while talking. The cave was filled with stalactites, and one had to be careful not to bump his head on them while surfacing in any of the chambers. The last chamber was especially intriguing; it opened into a shelf, shallow enough to stand with our heads above water, and from there, the cave continues upward. A diver can leave his gear there and crawl through a small tunnel into a larger chamber well above the water level. We had to leave early, though, when my brother’s gear developed a serious leak, and we left the cavern with him on the intructor’s octopus. The swim back was beautiful; the cave is illuminated with a deep blue light from the entrance, and it grew brighter as we swam toward it, with the softly lit cave looming all around. It was a strange, fearful, yet beautiful experience I’ll not soon forget. Three of us: me, my brother Javi, and our Swiss instructor Sylvia, returned to Helmet Wreck at 8pm to do a night dive. As we descended down the mooring line, the ship’s tower loomed out of the darkness below, and we shone our torches on the stern of the ship. I took a few photos of the coral-encrusted deck, but the camera had problems, and it soon stopped snapping. After about 10 minutes looking over the ship, we swam over to the neighboring coral reef, relatively shallow at 30 feet, and lush with staghorn coral. Clear shrimp swam around us, and little white sea worms which wriggled their bodies to move forward. 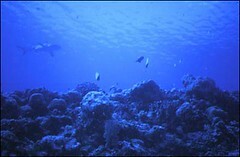 A large, soft, slug-like creature crawled through the coral, dark violet with vivid white markings on its back. In the blackness, I lost my sense of direction, but that wasn’t too important, since we were free to roam the reef, and the divemaster had her bearings. We didn’t return to the wreck anymore, surfacing instead above the reef, where the chase boat picked us up. With about half a dozen new divers on board from Tahiti, Australia, and the US, the Big Blue spent the night returning to German Channel, where we dove as a separate group. Easter Sunday’s first dive would be the Blue Holes: four holes in the shallows of the coral reef which plunged down to a huge cavern in the side of the reef, eighty feet deep. 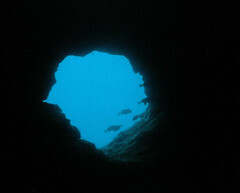 The cavern was well-lit with blue from the open sea, and the walls were coated with big clams and hard and soft coral. 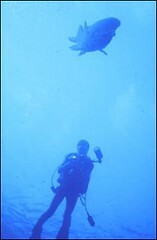 We left the cavern and dived along the reef wall, in the general direction of Blue Corner, another popular dive spot. Four blacktip sharks swam lazily by. I became disoriented as, even as I finned upwards, my depth gauge showed I was descending, and even my exhaled bubbles — my normal point of reference for ascent speed — were pulled downwards with me. Mom was pulled down to over a hundred feet before my brother managed to grab hold of her kit and pull her up. After some very hard finning, we managed to get above the downcurrent at around forty feet, and ascended to the surface to make sure everyone was alive and unhurt by the ordeal. I think I can honestly say we faced death in those precious minutes of fighting the downcurrent; Matt said he’d never seen one like that in Palau before. Well, after all that action, we needed a calm, relaxing dive; and we got one at Big Dropoff: a simple wall dive in the same area. We were treated to a sweeping vertical panorama of coral and fish life, visited occasionally by small reef sharks and turtles. It was especially cute to swim through a school of small bluefish, very intently feeding on plankton particles in the water. An individual bluefish would swim about in the blue, away from the wall, snapping its mouth open and shut every few seconds to catch a piece of food, then swimming around for the next morsel to snap up. I was reminded of my girlfriend’s turtles at snack time. No dive trip to Palau is complete without a visit to Blue Corner! A peninsula of coral jutting out from the reef, Blue Corner is famous the world over for the huge array of sea life it harbors; sea wrasses, barracuda, tuna, all other kinds of fish, and sharks, sharks, sharks by the dozen! But it’s a challenging, often difficult dive, with strong, shifting currents that make it risky, and scary, for beginning divers. With two divemasters, Matt and Sylvia, we descended near the area of Big Dropoff and swam away from the reef, headed through the open blue towards the Corner. There was no mistaking our proximity to the site: as we approached the Corner, a huge school of barracuda, flanked by reef sharks and tuna, passed over us, and the sheer volume of fish life surrounding us was staggering. The current began to pick up as a rock wall appeared out of the blue. As we approached it, swept along by the current, we took out our reef hooks and snagged onto rocks or dead coral, turned around to inflate our BC’s, and floated like balloons in the gusty current. The view before us was amazing. Reef sharks of different sizes, so many of them I had stopped counting, swam around the wall, while huge schools of snappers and jacks swam about, sometimes being chased by hungry sharks. We didn’t need to swim around anymore; as we floated in the current, tightly secured to the reef by our hooks, the sea life passed right by. We spent the rest of the dive just watching from the rocks, while sharks and fish put on a beautiful show of marine grace. Afterwards, when our time was up, we unhooked from the reef and ascended to be picked up by the waiting chase boat. Virgin Blue Hole, probably so named because it’s one of the more recent holes found in Palau, starts as a single shallow tunnel in the top of the reef, then extends down, down to over a hundred feet, before arcing out through the wall to open sea. As we descended into the tunnel, Matt pointed out a small opening to one side of the cave wall: a small cave which hadn’t yet been explored. We didn’t enter it, but my brothers took a quick look with their torches. At the bottom, the Hole was almost pitch-black, and lacking a torch, it took a moment for my eyes to adjust and realize that a soft blue light was filtering through from the other side of the tunnel. As we swam through, it grew brighter and bluer. My depth gauge read 105 feet. We emerged from the cave into deep water, so blue it was almost luminous. From there, we swam along the wall, our route taking us shallower and shallower as we progressed, till we ended along the shallow shelf of the reef. We spotted a turtle there, as well as a large sea bass. German Channel (not necessarily where the ship was anchored) is a channel blown through the reef by the Germans in WWII. Even today, German Channel is usable as a shortcut for small boats from the larger Channel to the Rock Islands and the harbor of Koror. It is also a beautiful dive spot. We entered the water a bit further up from the channel and swam over a sandy slope, dotted with coral “bommies.” As we made our way towards the channel, we passed a field of garden eels; tiny snakelike eels which live in the sand, their heads sticking above the sand, where they filter food from the water. There were hundreds of them, covering a wide expanse of the slope, so that they really did look like a garden of little eels. But as we approached, they ducked their heads under the sand, and the slope looked normal again; as though no eels had ever been there. A gentle current swept us down the channel, so we were flanked on both sides by rich fields of coral, teeming with fish life. We passed over several giant clams, some measuring as much as four feet wide. They sat there, mouths open to the sea, quickly clamming up when a diver approached too closely. Blacktip reef sharks roamed the area freely, and huge sea cucumbers sat bovinely on the sea floor, eating sand. Matt even picked one up and handed it to me, and I was surprised that the sea cucumber was soft-skinned but firm-bodied, pulsing with life, and warm to the touch. It occurred to me, as I handed the huge, 3-foot cucumber to my brother, that it might even make a nice pet. He returned it to the sand, upright and comfortable. We ended in a large, shallow expanse of sand, where we did our safety deco stop before ascending to the waiting chase boat. To cap off the day, we returned to Blue Corner, where we quickly hooked on to the same spot in the reef and watched the sharks again. We recognized several sharks from the day before who were still there, including a large grey reef shark with a ragged dorsal fin, probably scarred from mating. A turtle also swam past, closely followed by a sycophantic jack. The current wasn’t so strong as we disengaged from the rock, and we spent most of the dive time exploring the sandy patches along the reef shelf, which were also rich with a diverse population of sea life. A pair of friendly Napoleon wrasses also haunted the area, extremely friendly to divers, even coming close enough to touch. I was disappointed when we had to ascend for lack of air and no-deco time; the place was so beautiful. Our last diving day was rainy and blustery, and the speedboat trip to Ulong Island was a long and wet one, through a rough sea under an overcast sky. The first dive site, however, was well worth it. Siaes Tunnel is a deep cave, starting on the outside of the barrier reef surrounding Palau, and extending through the wall to the inside of the barrier. 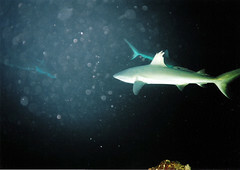 Inside the cave, different forms of sea life make their home, including a family of large reef sharks. As we entered the cave at a hundred feet, we saw the sharks, sleeping in the sand on the bottom of the tunnel. A gentle, bright blue-green light filtered in from the other side, and as we made our way to the other side, the sharks awoke and swam out with us. The rest of the dive was shallow, to make up for the extreme depth at which we swam through the tunnel, and we stayed around 30 feet, exploring the upper regions of the reef wall. At one point, we were accosted by a huge grey reef shark, at least six feet long, which actually turned to swim towards us before it change its mind and left. That was scary. 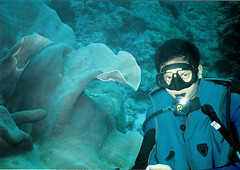 Similar to German Channel, the channel near Ulong Island was teeming with sea life. We started on a slope of coral, where two schools of fish (jacks and triggerfish) swam about in a small valley, harrassed by a pair of large blacktip reef sharks. From there, we made our way against a moderate current to the channel itself, where the current turned in our favor and swept us down a sandy aisle, between walls of beautiful coral in all manner of shapes and colors. We spotted groupers, turtles, and a huge expanse of lettuce coral, covering a whole slope of the reef with their hard reddish folds, and populated by hundreds of coral trout. After a big group photo session, we ended there and ascended to the dive boat. That was our last dive for the vacation, as we needed to give at least 20 hours before our flight to Manila to “gas off” the excess nitrogen in our blood. I spent the rest of the day resting, reading, and packing, as we would be leaving first thing next morning. Well, there we go! That was our trip to Palau, and here I am, back home now. Of course, the focus is on diving, but I how can I not mention the excellent staff on board the boat: they were all wonderfully friendly, divemasters and boat crew alike. I loved the trip: the diving was great, the people were great, the food was great, the accomodations were great; best live-aboard vacation I’ve ever had. If any of you folks out there are scuba divers looking for a great dive vacation in the Pacific, you can’t go wrong with the Big Blue in Palau. I strongly recommend it. Well, before I start sounding too much like a scuba advert, I shall log off now and start on my chores. Lots of email to answer, lots of pages to redesign, and forums to moderate. Bags to unpack, laundry to do, film to develop, and another rabies follow-up shot. If I can get my hands on a scanner this week, I’ll have pictures of the trip up by Sunday. Bye for now, folks! Full Palau photo album here.